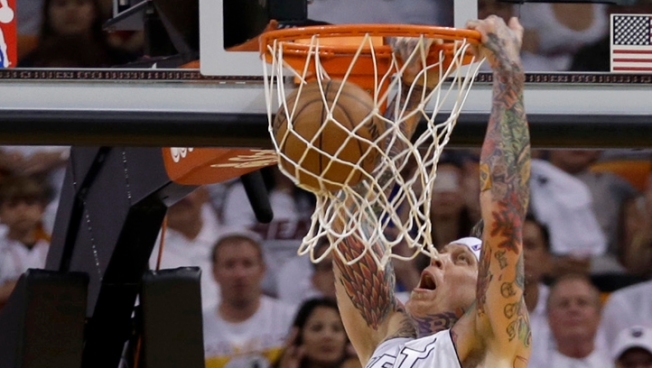 "Birdman" Dunk Best of Playoffs So Far? Andersen's dunk got TNT's Kevin Harland a little too excited on Sunday. TNT's Kevin Harlan is known to be an excitable commentator, but a massive dunk from Chris "Birdman" Andersen during the Miami Heat's 110-87 win against the Milwaukee Bucks on Sunday put the broadcasting veteran into hyper-drive. After a Shane Battier 3-pointer missed the mark, Andersen, like a vulture swooping in for an opportunistic meal, started the play from the top of the key and finished it with an emphatic two-handed dunk. Harlan, who has been with TNT for 18 seasons, then went bananas. "Oh here comes the Birdman. Flapping his wings and soaring for a sweet flush," Harlan exclaimed. "When you're aerodynamically designed with that hairdo, you can do those kinds of things, with that sweet Mohawk. It helps him fly." The comments got a chuckle out of Harlan's broadcasting partner Reggie Miller. Andersen finished the game with 10 points and seven rebounds in just 16 minutes.